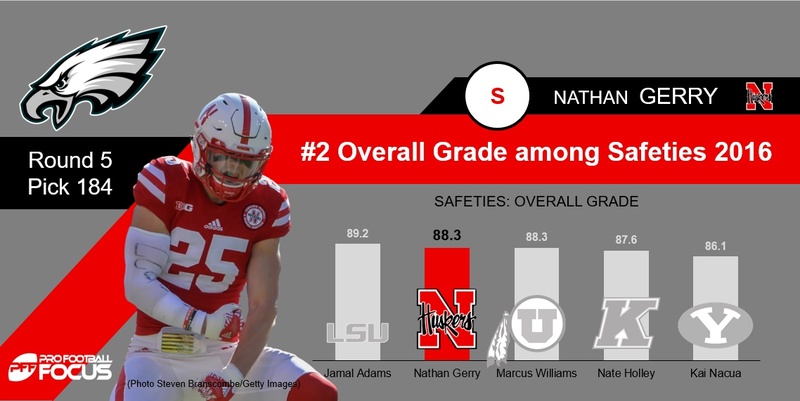 With the last pick in the fifth round the Philadelphia Eagles selected safety Nathan Gerry out of Nebraska. Gerry excelled in attacking the line of scrimmage at Nebraska, but struggled with change of direction in the back end of the defense. It appears that the Eagles will try him at linebacker this season to emphasize his strengths. In 2016, Gerry ranked fourth in run-stop percentage among safety prospects with a draftable grade from PFF. Gerry’s 90.7 coverage grade was second-best in the country among FBS safeties.